“Picasso Black and White,” installed along the spiraling ramp of Frank Lloyd Wright’s Guggenheim Museum, is an unforgettable experience. Picasso’s extremist vision can be especially exhilarating when realized in black and white. And the extremism of Wright’s white-on-white rotunda, that radical reimagining of the idea of an exhibition space, only raises the stakes, emphasizing Picasso’s Olympian intellectualism. You feel art and architecture converging as you turn from the daring yet delicate spatial enigmas in The Accordionist (1911), one of the grandest of all Picasso’s Cubist compositions, to the shifting spatial arabesques that are revealed all through Wright’s mobius strip of a museum. Picasso once said, “If I don’t have red, I use blue.” He wanted people to know he was not going to be bogged down by the niceties of craft. But if black and white was sometimes a shorthand for Picasso—and even occasionally a copout—it was also a way of cutting away the fat, of getting to the essentials. Going through “Picasso Black and White”—which was organized by Carmen Giménez—we can see that for Picasso the monochromatic palette fueled both a classical reticence and austerity and a romantic feverishness and hyperbole. Although black and white can surely be a vehicle for virtuosic display, there is a nakedness about Picasso’s greatest black-and-white works, a sense that this supreme artistic trickster has decided to deny himself some of the tricks of the trade. Of course in the context of this exhibition, black and white encompasses a rainbow of grays, from silken to inky, from plangent to opaque. 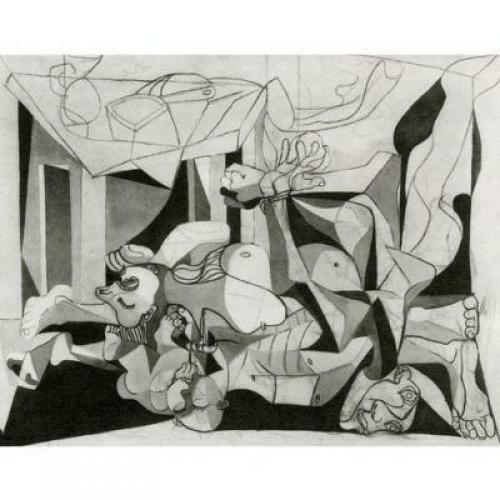 Nowhere in the exhibition is black and white more powerful than in The Charnel House (1944-45), Picasso’s response to the revelations of the death camps at the end of World War II. Although The Charnel House is often seen as a postscript to Guernica, it can be more accurately described as a riposte to the earlier painting’s rhetorical grandeur. In 1937, working in the immediate aftermath of the aerial bombardment of the Basque town of Guernica, Picasso still believed that individuals, however broken, could be heroic figures—and so he reimagined the citizens of Guernica as classical actors, embodying experiences of horror, rage, and hope. But by the end of the war, with The Charnel House, all hope has been abandoned, and black and white becomes a way of acknowledging the limits of what we can imagine. Here Cubism, with its playful fracturing of reality, is called upon to confront the Nazi’s horrific shattering of what had been thought to be reality. The individual man or woman is subsumed—if not entirely lost—in the mazelike, labyrinthine heap of bodies. The formal elegance of the construction—the collapse of anatomy into abstraction—feels pitiful, intentionally so. I know of no painting that so squarely confronts Adorno’s grave doubts about the possibilities of creating art after the Holocaust. Adorno said writing poetry would be “barbaric,” but in The Charnel House, Picasso’s black and white reconciles the barbaric and the aesthetic. It is a masterpiece of diminished means and blasted expectations. “Picasso Black and White” is not without its weak spots, though. The selection of works from the second half of Picasso’s career is by far the strongest aspect of the show. A museumgoer may crave a few more paintings from the Blue and Rose periods, even if they are not in a pure monochrome. Surely there could have been one or two additional major works from the first great years of Cubism. And some of the Neoclassical canvases from the early 1920s, especially two large studies of Picasso’s wife Olga, are quite weak. But all in all this is the most revealing exhibition dedicated to Picasso’s art since William Rubin mounted “Picasso and Portraiture” at the Museum of Modern Art, back in 1996. Like “Picasso and Portraiture,” this is an exploration of an essential aspect of Picasso’s art that forces us to reexamine the very nature of his art. It’s a landmark exhibition. Since the Renaissance, black and white has been associated with the conceptual side of creation—with the intellectual power of Florentine disegno rather than the emotional power of Venetian colore. For Picasso the conceptualizing authority of black and white is so great that it can encompass all emotion, all sensation. In works such as Man with Pipe (1923) and Sleeping Woman (1932), black and white expresses a classical serenity, the imagining self released to consider the passions dispassionately. In Still Life with Blood Sausage (1941), black and white has an almost diametrically opposite power, becoming a representation of pure palpability, of life’s earthy essence. And Picasso can also marshal black and white for unabashed virtuosity, as in a 1957 homage to Velázquez’s Las Meninas, where he divides a large canvas into light and dark zones and spins an outrageously elegant drama of iron, pewter, and silver sonorities. Few exhibitions can match the dialectical daring you find all the way through this show. Black and white intensifies our sense of Picasso’s changeableness. You see black as line and plane, surface and substance, pure thought and pure emotion. And the monochromatic scheme never becomes monotonous. Picasso is modern art’s ultimate dialectical spirit. He moves in different, sometimes in diametrically opposed directions, and yet his themes and counter-themes all add up. You leave the show with a heightened sense of the unity of Picasso’s art—of the conceptualizing energy that animates everything he ever did.